I was a bit surprised by the condition of the sign. 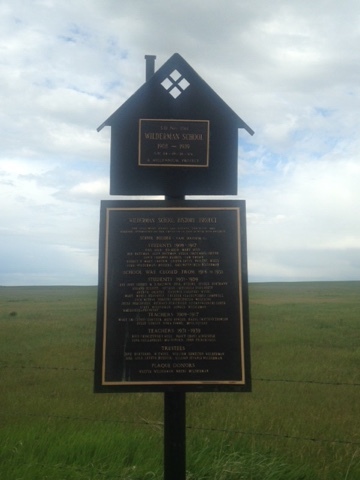 The Province of Alberta usually takes pride in keeping historical markers in much better shape. "Kasimir School District#1984, established on 29 July 1909, was the first organization in this region after homesteading commenced in 1907. Many of the early settlers came from the United States, especially North and South Dakota. 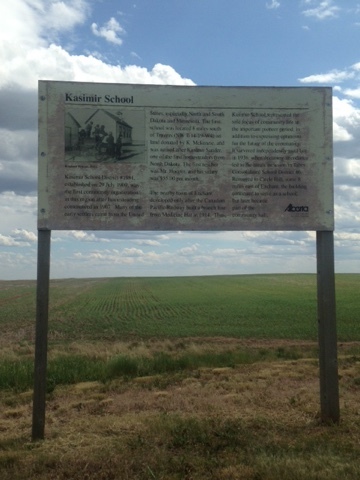 The first school was located 8 miles south of Travers (NW 7-14-19-W4) on land donated by K. Mckenzie, and was named after Kasimir Sander, one of the first homesteaders from North Dakota. The first teacher was Mr. Hooper and his salary was $55.00 per month. The nearby town of Enchant developed only after the Canadian Pacific Railway built a branch line from Medicine Hat in 1914. 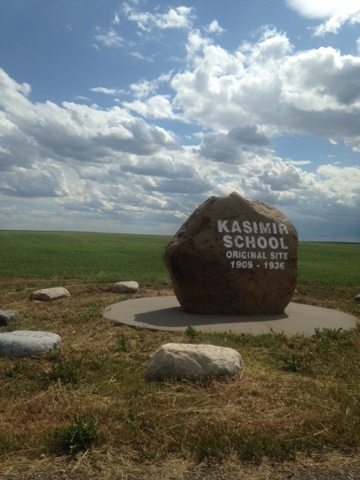 Thus Kasimir School represented the sole focus of community life in the important pioneer period, in addition to expressing optimism for the future of the commumity. 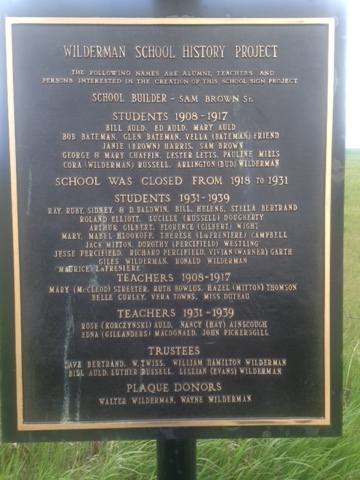 It survived independently until late in 1936, when declining attendence led to the area's inclusion in Taber Consolidated School District #6. Removed to Circle Hill, some 8 miles east of Enchant, the building continued to serve as a school but later became part of the community hall." The photo on the sign says it is from 1912. Even more interesting when you consider Alberta only became a province in 1905. The marker in the photo below was right beside the sign. 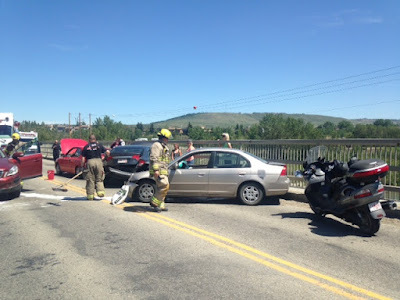 On that date and time I was on my motorcycle and I narrowly missed getting crushed against the railing on the Bow River bridge crossing northbound just south of Cochrane, AB. Still not exactly sure what happened. 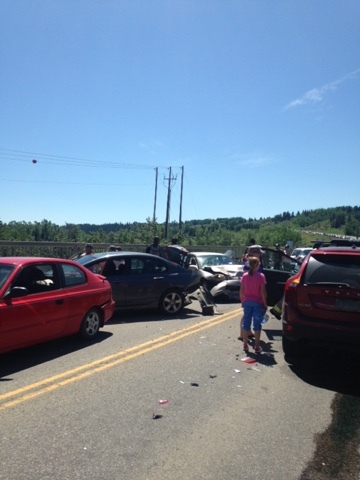 There was a four car chain reaction collision right in front of me. 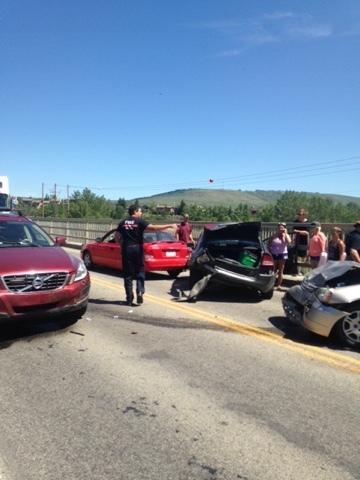 Both lanes of traffic were blocked when everything stopped. There were no serious injuries. I had just barely stopped, turned off the bike, and stripped off my helmet when four motorcyclists who were a few car lengths behind briskly walked up to me and exclaimed their amazement that I was not killed. They then went to take a look at my motorcycle and were equally amazed that I had no damage. Somehow I avoided everything. Looking northbound. 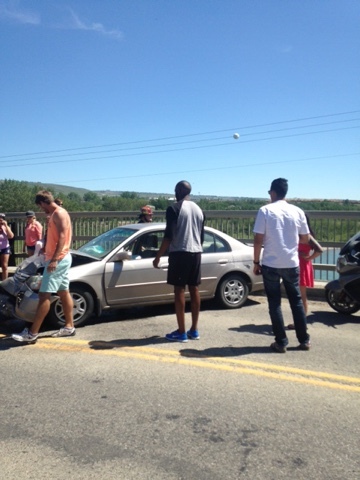 The Volvo in the opposing lane was hit. That is my bike at the far right. The view from the north looking south. I managed to avoid getting hit by inches. Still not sure how I managed that. I keep getting buffeted by unexpected events lately. Nothing really good or bad. Mostly things that have caused me to do some minor alterations of plans here and there. I want to squeeze the most out of my summer as I will likely get serious about some personal stuff in the fall. I am looking to take some courses or expand my skill set. To do what, I am not sure. I just feel the need to do something. There are times we just cannot be definitive as we cannot see where things are leading. The hypothetical and reality do not always coincide. Life is a series of changes. July and August beckon. Life tends to get more serious in September. If nothing else I hope everyone has a carefree summer. 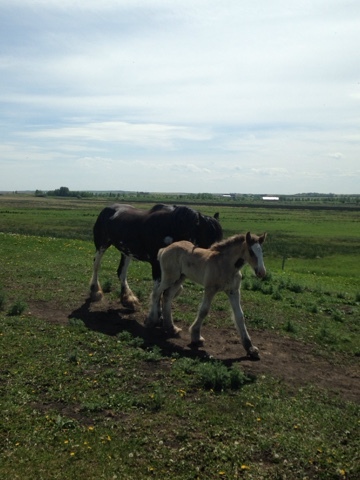 Took a drive south of Brooks, Alberta June 13, 2015 and noticed these in several different fields. No idea what these triangular things are or what they are used for. On Highway 23, east of Highway 804, southeast of Calgary, Alberta June 13, 2015. There is an empty field behind the marker. This is the first one of this particular type that I found that has a brief history to go with it. Being the curious sort, every time I see one when I am driving by I have to stop and check it out. Today is my father's birthday. He would have been seventy-three. He hated having his photo taken so you had to ambush him with a camera. 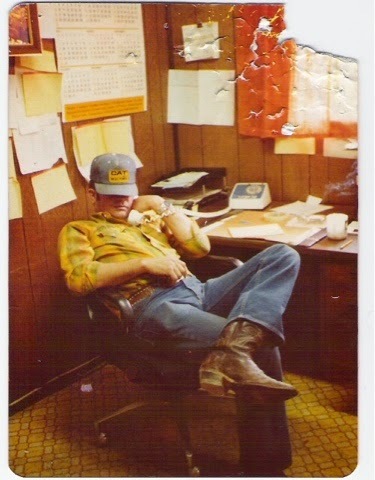 I believe this was taken in 1979, he was on hold at his desk in a trailer office in Cassiar, British Columbia. Cassiar does not exist anymore, like Thurber says, you could look it up. I really like this shot as it is. A family dog gnawed on the picture at one time. Years later I scanned it in case something else ever happened to it. I kind of like the teeth marks on it, it sort of gives the picture more character. I almost missed this on a side road since the grass was so high. There is a statue in a local park. Someone makes a point of dressing it up. Not just in summer, year round. In the winter you will see it with a winter coat, scarf, and toque. No idea who does it but it is fun to see. 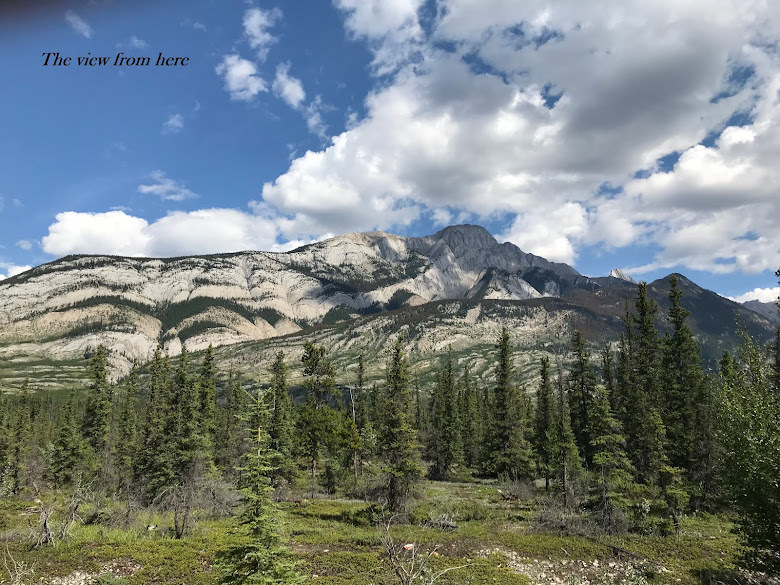 I have ridden the main highway between Calgary and Edmonton so many times I would rather take the backroads and take longer to get somewhere. The main highway between the two cities used to be called Highway 2. After the last royal visit it was named the Queen Elizabeth II Highway, or usually referred to as the QE II. Incidentally I kind of feel for Canadian government officials. There is a certain point where you run out of things to do for the monarchy and I think they were reaching the limits of their imagination where they named a highway after her. I have a great deal of respect for our monarch and I think she deserved better. On the other hand it is very hard to do something for someone who really does have everything. On May 24, 2015 whilst zipping down a few roads I am sure I have never been on I discovered a few schools. The first was right beside a secondary road. The second was hidden in the trees just off the highway. Elkhorn School 1902 - 1952 was boarded up awaiting its final fate. Rosebud School 1900 - 195? (the last number on the sign was heavily worn) is a rural community centre. Stopped at the side of the road after a few hours on the motorcycle for a quick break just outside of Airdrie, Alberta on June 7, 2015. As soon as I stopped these two came up to the fence to say hello. The mare loved being scratched behind the ears. Stopped for gas with the motorcycle on June 5, 2015. You rarely see a truckload of rectangular bales. I passed him on the highway. I think the load was shifting while he was driving since he quickly parked and was out tightening the straps. Nothing remains of the original town which was a rail stop. The tracks were torn up long ago and it is close to impossible to find the remains of the original rail line. The origin of the name is not certain. Whilst zipping up the backroads on the trusty Suzuki motorcycle on my way to Calmar, Alberta on June 5, 2015 I stopped at the side of the road for a short break. Off in the trees I noticed this structure. An outhouse that looks like it was built out of railroad ties. They don't build them like this anymore. 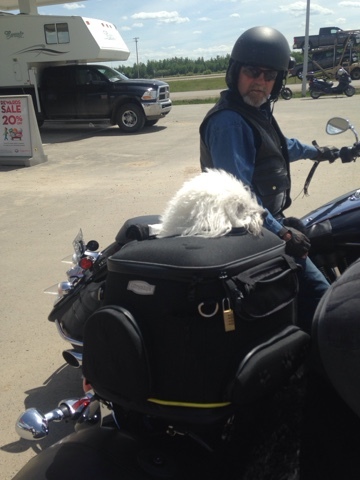 Stopped for a food break and noticed a dog carrier on the back of a motorcycle. The dog seemed to be enjoying its ride. Off to explore the countryside yesterday but needed to take care of some stuff. Paid an outstanding speeding ticket. Updated my driver's license address then I was told they needed a new photo. She did not tell me this beforehand. I had not shaved and I looked like I just completed a prison escape. I also was not getting my license back because the process was started. I come up for renewal in a year so I can fix it then. I was wearing a tie in my last one. Hopefully I will not need to provide identification I really look questionable. You know your place is small when the general store, gas station, liquor store, and post office are all in the same building. 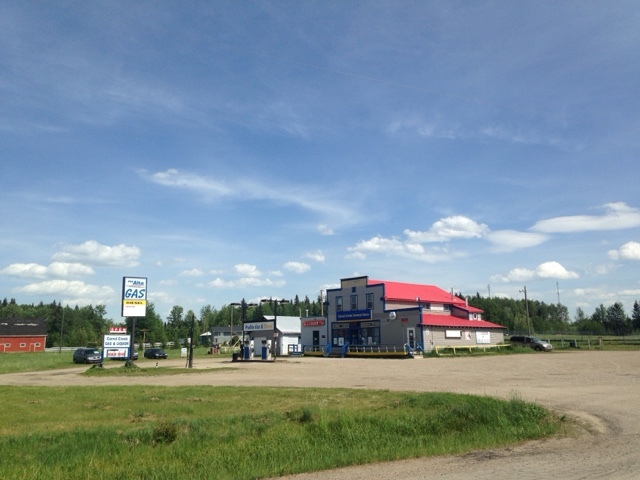 I was recently in Enchant, Alberta and the bank and car wash were in the same building. Mine did his best to look after his responsibilities and teach me the difference between right and wrong as well as a few other things along the way. He did all the important things and was there when I needed him. He died in 1997. I do my best to remember him everyday, not just on this day. For all of you, I hope you have great memories and equally great dads to cherish. Last time I was here it was in May, 19 2014. It is much nicer coming here June 6, 2015 when everything is green and in bloom. My cousin has her learner's permit for her motorcycle and needed some time on the road to get some experience in before going for her road test. If we were gping to do this I wanted a specific destination. 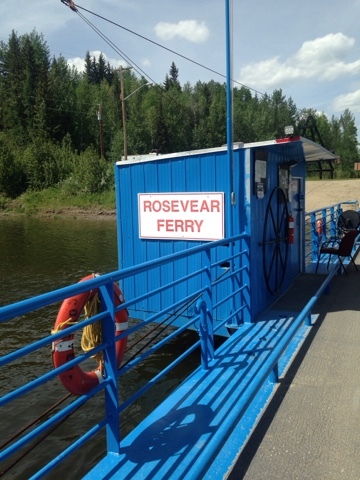 I suggested the Rosevear Ferry since she had never been there and it turned out to be a great ride. The total trip for the day was over two hundred fifty miles on the bikes. 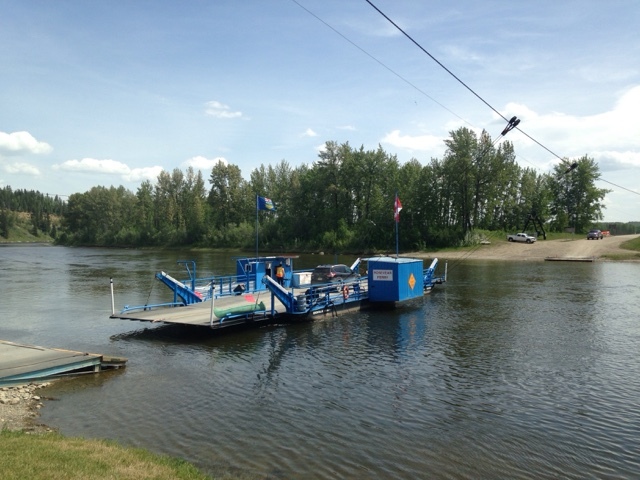 The ferry in one form or another has been operating since 1914. 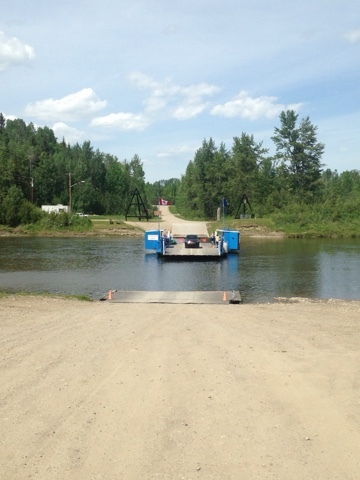 It is not much of a crossing and it is a very short ride. Myself and my cousin's bikes in front. My good friend is parked just behind. There was a woman who I would guess was in her twenties operating the ferry. I mentioned that the last time I was here there was an older guy who was the ferryman. He actually arrived a bit later and had been doing the job for over thirty years. I asked how she got the job. She said she applied. On a more serious note, she told me that there are not a lot of applicants for the job since it is rural and not a lot of people want to do it. There are times when the urge overcomes me and I cave to my baser desires. When that happens and I can hold off no longer I go forth to satisfy my inner demons. Unfotunately when I breakdown entirely and go to buy a bottle of Coke sometimes there is only Pepsi available. I rarely drink Coke but when I want one do not suggest Pepsi. It will not do and I would rather go without. It is not the same and will never be the same nor will it be a substitute. To me there is not compromise with some things. My mustard has to be French's, my ketchup has to be Heinz, and my detrimental-to-my-health carbonated beverage has to be Coke. Not diet either. The guy in the store next to me used to stock Coke, now it is Pepsi. He has lost my business. After work I will keep on driving and store hopping until I find what I am looking for. This is one of those times. Some things are worth the sacrifice. On a side road that is really a nice stretch of rural highway. May 18, 2015 side trip. I like these signposts where you get directions to where everyone lives. Likely not up to date. Pretty much all that remains. There was a schoolhouse near the church. Found while running around parts of Alberta on the weekend of May 16-18, 2015. Marking a spot where there once was a school. Someone went to a lot of effort for the brick one. 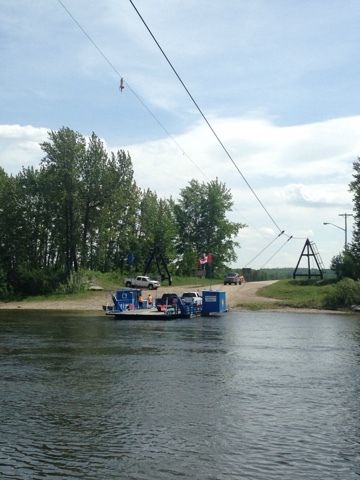 This is an institution in Drayton Valley and has been in operation since 1956. This is not the original location, it was originally less than half a block away. If you ever find yourself in Drayton Valley for breakfast you must eat here. I do not know where they get it but it is the best bacon I have ever eaten and they do not skimp on it. My mother and I got here just early enough to beat the Saturday morning rush. I have yet to see another one of these phones. Recently a light showed up on the dash showing a tire symbol. Saturday another symbol lit up showing a picture of a oil can and a wrench. I had the oil changed recently at a place that just does oil changes since I currently lack a place to do it myself. I figured it was time I paid attention to this stuff. Today I checked all of the tires, all were over 37 psi except for one. Apparently when you get your oil changed and ask them to check the tire pressure that is too complicated these days for someone to do that right. I corrected the tire pressure to the correct settings. The light on the dash still came on. I ignored that for now and turned my attention to the other symbol. All of the fluid levels were fine. So they must not have reset whatever it is you reset when you get the oil changed. After flipping through the manual, then consulting Google, apparently you reset the oil change indicator on a 2003 Impala through the radio controls. The radio? After reading that again I confirmed it was via the radio controls. You reset the tire indicator as well that way. Some quick trial and error I reset everything and all was right with the world. Makes me wonder who designs this stuff. There is no Bow City. There once was, for about two years about one hundred years ago. It is supposed to be near the site where I took this photo. There was coal mining at Bow City however the operation never amounted to much. I thought there might have been a sign marking where the town once was. There is nothing except empty prairie. I read that there are foundations of where the town had been. Bow City is also the site of a recent geological discovery. Apparently there is an large ancient crater from a meteor strike. I had no idea where to look for that either. I had done a little research but what you read about a site and when you actually get there can often be very different. On the plus side, it was a nice warm day. This is a unique school marker. These always seem to be in unexpected places. I have been going over prior posts and changing the font for easier readability. When the mood strikes I am also doing a little maintenance by tagging prior posts with labels. My cousin has her learner's permit for her motorcycle license. Since I have had my motorcycle license for years I previously agreed to ride with her so she gets some experience if no one else was available. We were taking a ride through the backroads on May 30, 2015 and I noticed a marker at the side of the road. It speaks for itself. Perspective can be everything. This is kind of deceptive. The bridge is quite big. The prairie makes it look small. And Google Maps for a little perspective. Head Smashed In Buffalo Jump is basically an oversized hill where the natives from time long passed used to drive them off a cliff. Personally I think the site is boring, I tried to get a decent photo of a horse out in a field. The last time this year that I took a ride out to explore west of Cremona on my motorcycle I just managed to avoid a thunderstorm. This time the sky had some dirty looking clouds however the weather held. Sometimes you find things in the oddest places. I saw a sign pointing off onto a gravel road showing the way to Big Prairie Hall. In the middle of nowhere is a pink community hall built in 1962. At the corner of Range Road 52 and Township Road 302 hidden in the brush is an unkempt gravesite. There is no date and no other markers. A lot of times people were buried on their land. This is just past the gravesite. The gravesite is very small and enclosed by a chain link fence. I was beginning to think the deer was posing for me. I got nine photos and it did not move at all. Ran across some people fishing. The water is so clear you can see all the way to the bottom. Root Beer ice cream is my kryptonite. MacKay's has been around since 1948. They were still there when I dropped in via motorcycle on May 20, 2015. The ice cream is somewhat famous in Alberta. Original ice cream making machines and cream cans. You just might be a . . .